Small businesses are having a hard enough time these days, and as if the recession wasn’t enough, imagine getting stuck with counterfeit cash after providing a service or product to a consumer. It’s happening more and more. 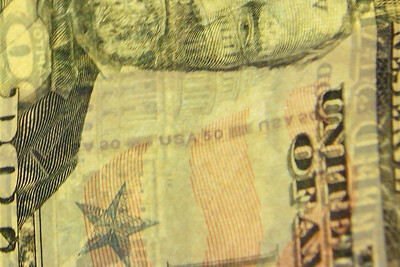 Click here to check out this report on the problem of businesses getting stuck with fake money, by Greensboro NBC affiliate WXII. One phone call from the bank sparked it all. “Your deposit contained a counterfeit bill.” That’s what the bank said to my wife over the phone. A customer paid with a 50 dollar bill, but lo and behold, it was actually a five that had been “washed” and re-printed with 50 dollar markings. The crazy part is the way these counterfeiters work, the special pen that businesses use to detect fake dollars doesn’t even work. Why? Because the paper is that of a real bill. The problem is it’s been bleached and remarked with different amounts. The whole thing has left my wife and many other small business owners, like her, frustrated by the fake cash that contaminates their bank deposits. And if getting ripped off by a customer isn’t bad enough, the bank wouldn’t even credit her account for the five dolalr dollars, let alone the 50 dollars. One is real one is fake. Can you tell the difference? The picture above to the right is a real 50 dollar bill. The fake 50 dollar bill my wife received is below it. 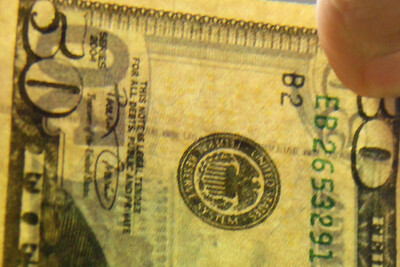 The fake bill looks slightly more washed out. The left picture below has the real 50 dollar water mark. 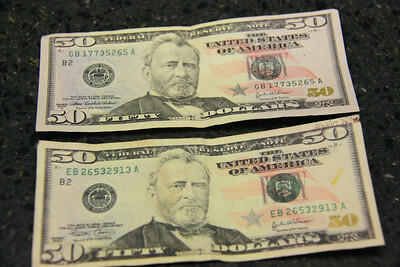 It says “USA 50.” The right picture below has the five dollar water mark, on the fake 50 dollar bill. It says “USA FIVE.” Watermark verification is one of several measures you can use to check the integrity of the currency. The U.S. Secret Service has advice for business owners on how to detect the fakes. The U.S. Dept. of the Treasury has also campaigned diligently against currency fraud. Business owners are stuck when it comes to combating bad bills. Monitoring every single cash transaction is time consuming and can ruin the owner and customer relationship due to distrust. Is it due diligence or bad business to closely examine a customer’s money when they pay? Unfortunately, it’s become a necessity. So the next time you pay for something, if you see the cashier take an extra close look at your cash, at least you’ll know why.